Hot on the heels of Rockman X, Capcom is looking to roll out another classic Rockman adventure for the Wii's Virtual Console. 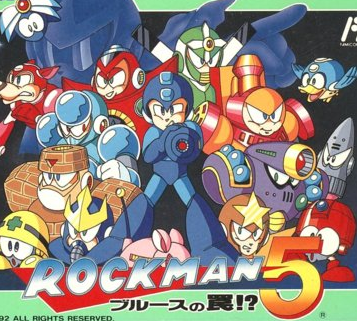 According to Nintendo Japan's newly updated May release schedule, Rockman 5: Blues' Trap?! is set to release on the service this month. 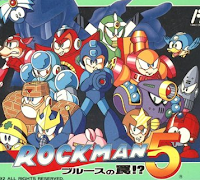 As with all Famicom titles, Rockman 5 will run for 500 Wii Points. An exact release date is still up in the air, but Capcom usually likes to surprise us with these things. Mega Man 5 should also be around the corner any day now, too: the ESRB rated the game not too long ago. As the classic series nears its end on the Virtual Console, one wonders where Capcom will go from here. X1's sudden debut seems to indicate a transition into re-releasing the SNES/SFC X series titles. Further, we can also hopefully look forward too Rockman 6/7, Rockman & Forte, and RockBoard. Virtual Console announcements seem to happen upon a moment's notice. Who knows what we'll get next! Lol, Rockboard. That's a different thought. But it doesn't seem very likely, considering that it was a Japan-only release. I find that the VirtualConsole tends to only release titles that have had multiple releases. But that's just me, and I could be wrong. They do occasionally release import titles. Whenever they do, it always ends up costing a dollar more than what's normally charged. Too bad Nintendo doesn't give enough care to allow online play for VC titles. Rockboard is a very fun game. @Dr.Jerk: super Mario bros 2(Jp) and sin and punishment say otherwise. If it was big in japan, and a major game to the company/franchise then don't rule out a VC release. And considering sin and punishment got a sequel because of VC sales... See where I'm going with this? @Anonymous talking about SMB2 and Sin and Punishment: Those titles, mostly SMB2, are very well known outside of Japan. Rockboard is a board game spin-off title that is hardly well known in other places. Sure they intended to release it overseas, but it got cancelled, I'm guessing because it wouldn't do so well. That said, it's still doubtful that if Rockboard were added to the Japanese VC, it would come overseas. Hope the VC MM7 is the original... that is, the one where Bass has a potty mouth. Oh, and Mega Man's Soccer, too. Hee hee. I doubt it. The VC version of X1 removed "Damn" from when X talks at the end of the intro stage when Vile escapes. The "Damn" line was ADDED in X Collection. It was never in the snes version. The VC version is based off of the snes version. Hmmmm.....? Now I'm thinking if the Megaman 9 secret is revealed hmmmmmmmmm...?